The What: Chief is bringing Da-Lite ViewShare technology to Fusion display mounts. 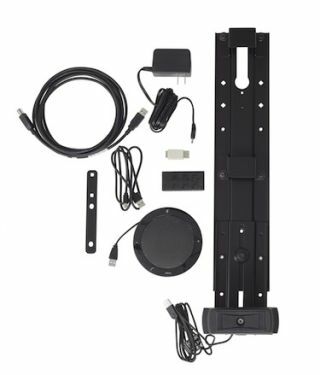 The new ViewShare Fusion kits include all the video conferencing accessories needed to create a bring-your-own-device video conferencing room. ViewShare technology fills the gap between high-end video conferencing systems and personal smart devices. The solution helps meet the increased need for face-to-face meetings in today’s remote working environment. The What Else: With one SKU, ViewShare kits feature: a Fusion mountable accessory to position the integrated Logitech C930e webcam above, below, or between displays; a Jabra SPEAK 410 MS USB speakerphone; a Belkin powered USB hub; easy USB 2.0 connectivity (USB 3.0 ready); and components that are Skype for Business Certified, and optimized for Lync and Skype. The accessory works with all the new Fusion fixed and tilt mounts, as well as Fusion carts and stands. An extra-large version is available for bigger displays. The extender version includes a USB to CAT5 extender with power supply for installations requiring more cable reach. The Bottom Line: “Our customers were looking for ways to quickly add video conferencing capabilities to huddle spaces and small meeting rooms," said Kathryn Gaskell, product manager. "ViewShare provides that option with the additional benefit of being easy to use."